You can use BaseCamp to plan your next hiking, biking, motorcycling, driving or off-roading trip. 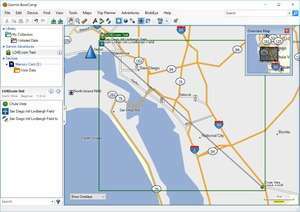 You can view maps, plan routes, and mark waypoints and tracks from your PC and then transfer them to your device. BaseCamp displays your topographic map data in 2-D or 3-D on your computer screen, including contour lines and elevation profiles. For security reasons, you should also check out the Garmin BaseCamp download at LO4D.com which includes virus and malware tests. Additional screenshots of this application download may be available, too. Garmin BaseCamp has a presence on social networks. Garmin BaseCamp download been highly rated by our users.